It would not be an exaggeration to say that China is often the most-covered country in the news today. If you've read any business publications lately, chances are you've seen an article or two covering language and cultural barriers in the global marketplace. A net-shaped metal forming process has been developed for manufacturing quality, durable, high-yield and cost-efficient gears for high-volume production. The presence of significant errors in the two-flank roll test (a work gear rolled in tight mesh against a master gear) is well-known, but generally overlooked. The status on traceability of gear artifacts in the United States. There's a monster under the bed of the nation's economy. It has the same power over many adults as a child's nightmare. Understanding the differences of how the gear industry works in individual territories around the world is vital to any company that wishes to succeed on a global basis. The complete Product News section from the May 2008 issue of Gear Technology. 2008 World Congress on Powder Metallurgy, plus the technical calendar. Complete Events section from May 2008 Gear Technology. 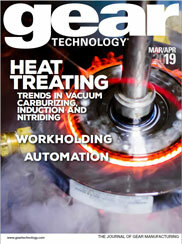 The complete Industry News section from the May 2008 issue of Gear Technology. Dollhouses may be toys for children, but an old-time working miniature machine shop is the ultimate toy for a self-proclaimed hobby machinist like Greg Bierck.